Ultima-Lube II Lite Oil – Very low viscosity. Ideal for extreme cold weather use. Recommended Uses: Tightly fitted handguns of minor caliber. 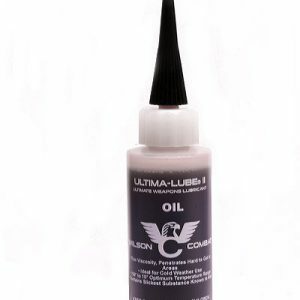 Ultima-Lube II Oil – Thin viscosity penetrates hard to get to areas. Ideal for cold weather use, 10° to 350° F temperature range. Recommended Uses: Tightly fitted handguns of all types. 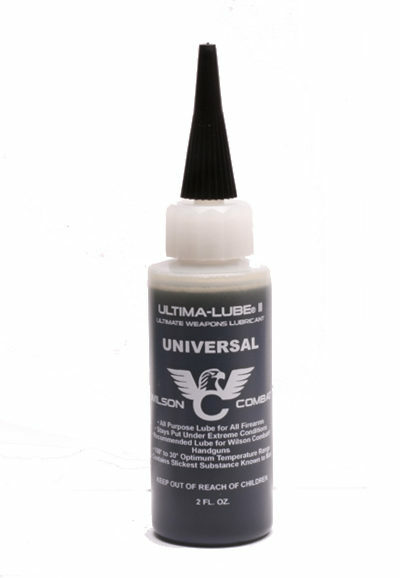 Ultima-Lube II Universal – All purpose lube for all types of firearms. Stays put under extreme conditions, 40° to 350° F temperature range. Recommended Uses: Service pistols/revolvers and broken-in custom handguns, Long guns of all action types, AR style rifles in the 20° to 50° F temperature range. 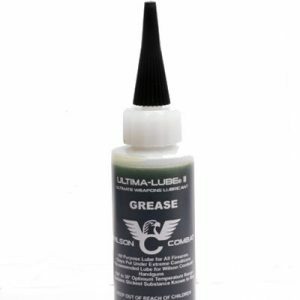 Ultima-Lube II Grease – Ideal for heavy wear areas. Stays put under extreme conditions, 40° to 350° F temperature range. Recommended Uses: Full and Semi-Auto rifles and carbines, Optimal in AR style rifles at temperatures above 50° F.
Once your firearm is broken in, lube only those areas where you see visible wear, lubricating areas that don’t have contact will only attract debris and fouling.